AFC Wimbledon have signed striker Mark Nwokeji following his release by Dagenham and Redbridge. The 28-year-old London-born frontman has come close to joining the Dons on three previous occasions. 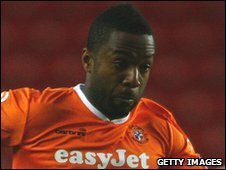 Nwokeji spent five months of last season on loan at Luton and previously played for St Albans and Staines. "He is a proven scorer with pace and strength, and will bring competition to the front line," Dons chief executive Erik Samuelson told the club website. "I remember speaking to Mark at the Ryman League end-of-season dinner in our promotion season. He was presented with the golden boot and I told him then we would be watching out for him to try and bring him to Kingsmeadow," he added. "With our recent injury record with cruciate ligaments we have taken extra precautions in checking Mark's recovery from injury. "Mark is having a scan and if, as we confidently expect, that is clear, the formal paperwork will be completed soon afterwards." Nwokeji said: "I've flirted with this club for a number of years now and it's great to be here."